Now that the 20 unit (“Big Trux”) is about finished, we’ve started working on the 8 unit next door. 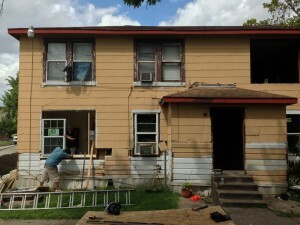 It’ll get the same exterior face-lift (new siding, paint, windows) and interior upgrades. This, along with a host of other “under the hood” upgrades like a replacement of the main plumbing line, leveling the properties, as well as a slew of interior upgrades (updated kitchens, central air, refinish the original hardwood floors, etc).